Severe thunderstorm moving towards Sebastian, Florida. 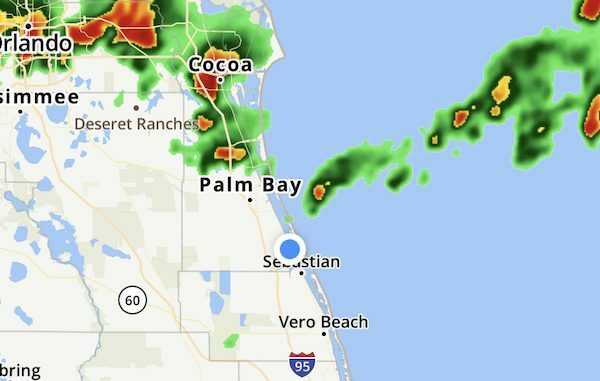 SEBASTIAN – We are watching a severe thunderstorm that showed up on the radar this morning that has a history of hail moving south from Cocoa and Rockledge. As of 9:05 a.m., the storm is heading southeast towards Sebastian and Vero Beach. “Severe thunderstorm with history of hail up to ping pong ball size moving towards Sharpes and Coca. Take cover from this severe storm,” the National Weather Service said in a statement. Quarter size hail was seen in Rockledge at 9:05 a.m. as the storm was traveling southeast. Dime size hail was seen in Melbourne at 9:10 a.m. as the storm continues to travel south. Update: As of 9:35 a.m., the storm is now moving into Palm Bay. Update: As of 9:50 a.m., the storm is moving into Grant. Update: As of 9:57 a.m., hail up to 1 inch occurring now in Cocoa near I-95 and 520. Quarter size hail seen in Indian Harbor Beach. Update: As of 10:05 a.m., very dangrous storm with hail now moving into Sebastian. Update: As of 10:07 a.m., Hail seen in Sebastian.